I seem to be having problems getting my photos to upload I keep getting http error. I did get one to load last month but have been unable to get one to upload again. Any ideas?? Hate to bother people but don’t know what is going on, the size of the pic is well with in limits. I am going to edit your post to include the response and put this in the help category because you’re not the only one who is having this problem. 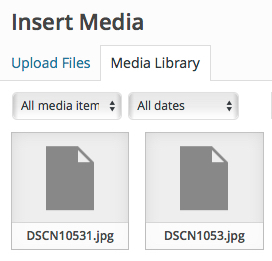 If you click the media link (camera and music icon) from the dashboard (or from within a post) and look at the library view, you will see all media items you have uploaded … and those that have not-completely uploaded. I found two image files from you that appear as a blank page rather than a thumbnail, indicating some sort of an issue. 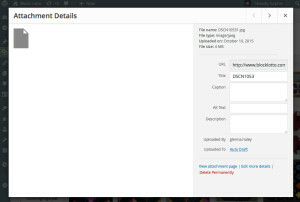 If it had successfully uploaded, you would see the image on the left and have additional options, for example, to edit it, on the right. 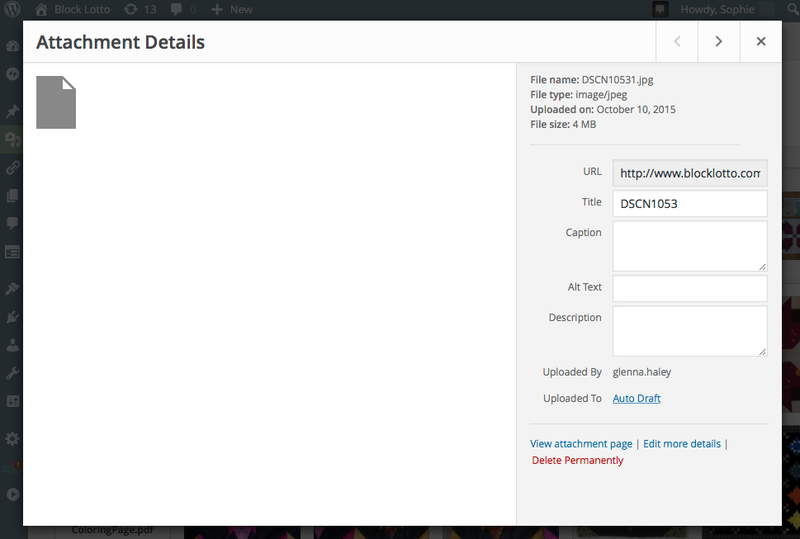 On this file, you have limited information and options, however in the upper right corner, you can see. While you are correct that the file size is “within limits,” four megabytes is much, much, much larger than an image being displayed on a webpage needs to be and I believe the size is the issue. Maybe it was just taking a lot longer than you expected, or something between your computer, ISP, the internet and the hosting computer timed out. Since I moved to an older neighborhood (with a slower internet service), I also sometimes have this problem (my default sized images are 3 MB). FYI, there are some other failed images uploaded by others showing up in the media library that are even larger at 6 MB. Whenever someone has problems uploading images it is always because they are large. Most camera/image-handing apps have the ability to scale the image, sometimes with a specific setting for “web” or “email–that is the size images you want. I have edited your post to include what I believe is the problem and moved it to the help category because you aren’t the only one that has this problem.